Exeter City manager Paul Tisdale has hailed the performance of 16-year-old Ethan Ampadu in their 3-1 FA Cup first round loss to Luton Town. The Wales youth international played in midfield for the first time, and set up City's goal after his shot came off the post and was put in by Reuben Reid. "He was brilliant and well done him," Tisdale said of Ampadu, who became City's youngest ever player in August. "It's a real delight to see him play, and you keep forgetting he's only 16." 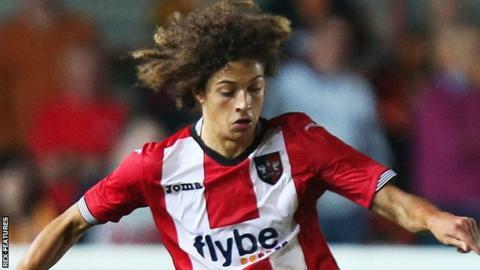 Ampadu, who has previously played in central defence for Exeter this season, has been linked to a host of top clubs since his debut in an EFL Cup first round win over Championship side Brentford. His emergence has been a bright spot in an otherwise difficult season so far for City. The club have not won a league game at home since April and are one point off the League Two relegation places with the Supporters' Trust, which owns the club, voting in favour of a motion that could see Tisdale have his contract renegotiated. "He's just turned 16, he hasn't played in midfield in the first team for us, he's been playing at the back, but he stepped into midfield and did a very specific job for us," Tisdale told BBC Radio Devon. "He benefitted from the team being on the front foot and being in the opposition's half, so he had the game in front of him, and did everything right - hardly made a mistake."